Ask yourself: will my dog be comfortable and happy on a long trip? Some animals prefer to stay home and a “homesick” pet will ruin everyone’s trip. In such case, it may be wise to consider a babysitter for your dog, either a trusted family friend or a hired pet sitter. If that isn’t possible, you might want to consider housing your dog in a veterinary clinic or kennel. If you decide to take your dog with you, take as much care in preparation for them as you would for yourself. Whether you want to travel by plane, bus, train or boat, find out if your dog will be welcome and what kind of travel preparations you need. If you plan to stay at hotels, motels or campgrounds, you must check if they are animal-friendly. Some establishments, for health reasons, ban pets from staying. Contact the airline well in advance, as each one has special regulations for pets on planes. Be sure to ask about the companies rules for pets in crates or carriers. Try to book a direct flight with no stop overs. If your dog is small enough, some airlines will allow you to keep your pet in a crate under the seat in front of you. If your pet must go in the cargo hold, be at the airport early. If your pet is not adjusted to being in a car, take him/ her for a few short drives before the trip. Avoid allowing your pet to stick their heads out of the windows of a moving vehicle. Debris and dirt particles pose a risk to your dog. If it’s a long trip, plan stops every two hours for snacks, water and exercise. Give your dog a big meal at the end of the trip, preferably dry food. It’s more convenient and will eliminate frequent bathroom breaks. It is never a good idea to leave your pet in a locked car along for long periods of time. If you must, lock your doors and crack the windows for proper ventilation. Remember, on hot days, the inside of a car can get very hot and could give your dog fatal heat stroke. Not all trains or buses will allow you to take your pet on board. Call ahead to make sure. VIA Rail does not permit pets to travel in passenger cars, but may travel in crates in the luggage car. Some cruise ships do welcome pets, check with your travel agent for more info. Ensure your pet is always wearing their collar with complete ID and license tag. Pack their favorite food, toys, dishes, cool water and a leash. Have your pet examined by the vet before you leave. 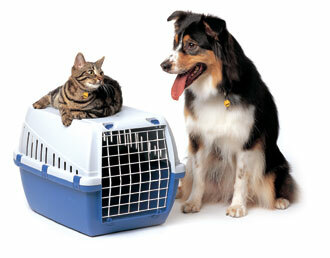 If your pet must travel by crate, ensure it is well-made, durable, and of adequate size and comfort for your animal. If you are planning an international trip, ask your travel agent for advice regarding health and vaccination regulations.